This week (week 30) four probable human cases of West Nile fever have been reported in an already affected area in Greece. No new cases have been reported in the neighbouring countries. 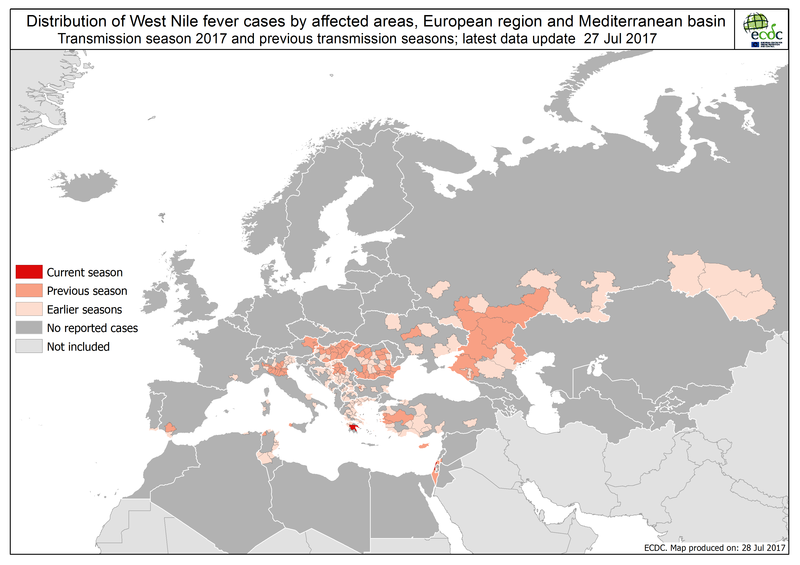 Since the beginning of the 2017 transmission season and as of 27 July 2017, five human cases of West Nile fever (one confirmed and four probable) have been reported by Greece. In the neighbouring countries, one confirmed case and three probable cases have been reported; all of them were reported by Israel. Weekly updates with the latest reports on West Nile fever cases in Europe. Interactive maps and tables updated every Friday, during the transmission season.